Over the weekend we were passing through Kingston, looking for various things (all of which we found). On the way back we took a slow bus which went around most of the houses between Kingston and Richmond, and there is nothing much between Kingston and Richmond except houses (and carefully shielded greenery). Although rows of houses are a de facto feature of suburbs, these houses seemed more oppressive than anything one might spot in Harrow , or along Western Avenue ; identical mockeries of Tudor, securely oblong, large in diameter but still bearing the scent of suffocation. The road name Anne Boleyn Way gave it away; this was Reggie Perrin country, a place for those who had made their peace with the racket of the city and wanted nothing else in their lives save peace even as their inner pieces disintegrated. Perhaps it’s unfair to damn places like Ham and Petersham; these are, after all, perfectly good places to bring up children – lots of parks (including Richmond Park), relatively easy access to town (so long as you have a car, and if you don’t then what are you doing here? ), minimal crime rates, nothing remotely simulating a fuss – and yet gazing at these dappled, quiescent boxes on a glorious Sunday lunchtime, I knew that were I growing up somewhere like this, I would look for the quickest and brightest escape route as quickly as possible. The opening blast of “Route 66,” where some young men who certainly knew Kingston flee to another Kingston , still sounds like a ramrod exploding its way out of this pacific trap. Rhythmically more compressed than the Beatles – Charlie Watts keeps the beat linear while everyone else does his best to make it as jagged as possible, guitars like razor-strewn tyres cutting up the road behind them to ensure that the past is securely and firmly burned – this bears a determination still in the process of being articulated but breathes escape from its innermost pores. Jagger is still a little dazed by it all, hasn’t quite evaded the future London orbital ring – “Barst-OW, SANE Bernardino!” (and Barstow , as Lena pointed out, is not a big place, but crucially it is a different place) – but Watts’ concluding crash of ride cymbal demolishes the gate of polite and sets the sixties (or Britain ’s sixties) free. A journey very different from Cliff’s jolly Number 9 bus – we are still only three entries away from Summer Holiday but that world seems to have been eclipsed forever – “Route 66” offers a rawness different in kind and background from the Beatles. Overall the first Stones album is a logical step from Barber and Donegan’s world, via the key bridge erected by Alexis Korner and Cyril Davies; there is a furious purism at work here as well as an anxiety to batter down purism’s restricting bonds. If the Beatles basically approach rock ‘n’ roll from its pop angle, the Stones come at it from a metamorphosing angle which was in time to be known as rock. The Beatles are anarchic alchemists, the Stones stern reformists. This difference is immediately apparent on the album sleeve of The Rolling Stones. 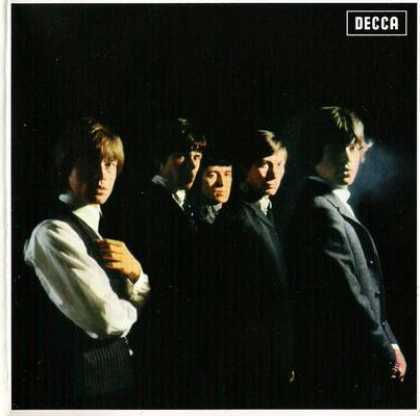 Notice that, apart from the requisite Decca logo, Nicholas Wright’s cover shot – not so much Out Of The Shadows as forming new ones – has the cover all to itself; for b(r)and identification you have to turn to the rear sleeve where huge black blocks of logo almost blot out the rest of the allotted space. Similarly, the Stones do not exactly glare out at us from the cover and if anything look slightly nervous, as though preparing for a trainee business seminar speech. Still, the individual photos on the rear bring nothing so much to mind as the cover of Heaven 17’s Penthouse And Pavement; Jagger & Co. look like nominees for Young Businessman Of The Year; studious, industrious, getting down to dealing with profit margins. It is difficult to take the Home Counties out of any would-be rebels, but note the decidedly Home Counties premature arrogance of the absence of name(s) from the cover which slightly overrides the collective fear; what, you don’t know who we are already? Well, you should. The key word here is “sound” since, much more so than the Beatles, the Stones were (at this stage) necessarily a group at one remove. They learned everything they knew through records – records, I must again stress, that were hard to find, that you had to know about or sneakily rip off an uncle or cousin or neighbour – and from the off they were acutely aware of the differentials between live performance and studio recordings, that the album had to exist as a distinct thing in itself. Keith Richards has recently spoken of the group’s keenness on working the studio, distancing or clustering their instruments and voices to create something that retained the spontaneity of live performance but was subtly incapable of being reproduced on stage. Nowhere on the album is this better demonstrated than on their reading of Bo Diddley’s “Mona,” the reason why you’ll need to hunt this album down in its original form (thanks to the idiosyncratic inclinations of Allen Klein, only the US versions of the sixties Stones albums are currently available on CD; the equivalent here, retitled England’s Newest Hitmakers, substitutes “Not Fade Away” for “Mona”). This achieves a weightless anti-existence uncanny by 1964 Britpop standards; the famous “hands off” guitar motif was inescapably heard and absorbed by Johnny Marr, of course, but Jagger’s voice seems to be roaming the room like an impatient moth awaiting butterfly upgrade; now it’s up close, now it’s 20 feet away and nearly buried in Chislehurst caverns of echo. “Gonna build a house next door to you,” he announces like the tannoy at Richmond station, before darting down a purple river to quiver about his heart going “bumpity bump.” Meanwhile, Jones, Richards and Wyman collectively give ecstatic shivers up and down the pentatonic scale, slithering like Mingus’ rogue snake. The performance – almost a landscape – could go on forever; the minimalist hypnosis a strange (but entirely logical) forebear of both Barry White and Phuture. Generally at this stage the Stones do better with R&B. Willie Dixon’s “I Just Wanna Make Love To You” is a grinding punk cluster when compared to Etta James’ patiently panting rendition. Guitars and drums cut mercilessly through verse/chorus lines; Jones’ harmonica is acidly multiphonic (reminding us that Ayler paid his dues backing Little Walter), a tambourine adds itself to the melee somewhere along the line and there are truly startling bitonal guitar grinds/squeals from both Brian and Keith. Jagger hasn’t quite got the knack of grittily sensual yet; his repeated simian hiccups of “love to you baby” are more akin to Bernie Winters than Muddy Waters, but he’s undoubtedly getting there. Jimmy Reed’s “Honest I Do” is treated with an almost ska-like arrangement with snarling commentary from both guitars and a Sunny Murray bookending of cymbal sizzles from Watts . Slim Harpo’s “I’m A King Bee” depends almost entirely on Wyman’s rumbling, jittering bass; Jagger booms “Bus awhile!” and gives the nod to Jones to come in with abrupt eruptions of barks, farts and blimps while Wyman slithers up and down his octave of pelvic thrust. Pitney was also the first performer to have a UK hit with a Jagger/Richards composition – “That Girl Belongs To Yesterday,” top ten in the spring of 1964 – but “Tell Me” is the first Glimmer Twins composition to be recorded by the group themselves. Oddly, for a band so seemingly steeped in R&B, many of their early compositional efforts tended to be yearning ballads, clearly influenced by the great girl groups of the period (chiefly, as with the Beatles, the Shirelles). “Tell Me” is as hesitant a first attempt as you’d expect. Starting with some reasonably delicate acoustic guitar, Jagger intones “I want you back…again” in a very hesitant delivery before the group make a sudden, bold leap. There is some crisp tambourine and an enterprising attempt at a group chorus (Keith’s harmony vocals are unstable but enthusiastic). “I tried to tell you,” begs Jagger, “but you…didn’twannaknow.” As he skis involuntarily down that emotional slope Jones cushions him with a ruefully mirthful shake-of-head guitar figure. Then, suddenly, with the instrumental break, we are back in the land of The Shadows . “I hear the knock on my door” (cue Watts ’ dutiful tom toms) “that never comes,” moans Jagger, before he and the rest of the band work up towards a messy climax (“I’m comin’…HEY!...OWWW!!”). The glorious fracas that ensues sees the song disintegrate altogether into random giggles, yelps and out-of-tune harmonies as Jagger barks “Come OWN! Come OWN!” before the engineer abruptly fades both him and the track out. “You Can Make It If You Try,” originally a US R&B hit for Nashville soulman Ted Jarrett, is handled almost as a Salvation Army recitation with stately tambourine and church organ; again the result is awkwardly enterprising if not remotely near country going soul (Jagger addresses the subject of the song as though at a board meeting, already anticipating “Let’s Work”). But their closing romp through Rufus Thomas’ “Walking The Dog” demonstrates that when they didn’t try so hard, they worked better (the occasional cluster of wolf whistles notwithstanding). Again, Jagger is manfully (or boyfully) striving with his drawls of “dressed in BLAAACK” and “silver BELLLLLLS” (and invents Lou Reed in the process). Brian tosses off a good, purposeful solo and the general thrust is one towards garage rock (albeit underscored by bubblegum handclaps). The final frenetic flourish opens the magic carpet up rather than nailing it down; The Rolling Stones is a hugely sloppy album which probably took fractionally less time to record than it did to play, but in the middle of 1964 that simply didn’t matter – they are clearly going somewhere, if still groping clumsily, and the sense that any of its hundreds of thousands of listeners could have done just as well in their own bedroom was an absolutely vital one. Escape from the relapsing suburbs is achieved; they open up the road to rock by unzipping it and daring you to mock the redness of their tongues.